This isn’t a particularly challenging dish but it did provide me with an excuse to finally buy puff pastry. 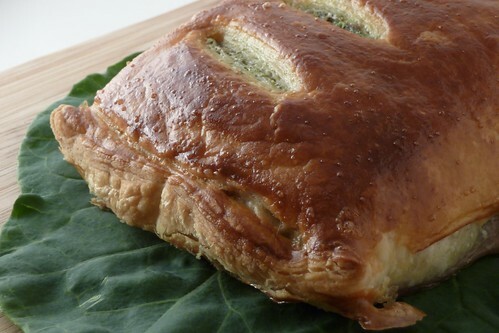 (Which also meant that I’d be able to make buljons pīrādziņi as a treat for my husband, so win-win all around.) I opted not to make the pastry because frankly, I’m leery of making puff pastry in my shabby, rundown little kitchen, because I just plain don’t have the counter space to really make a good go of it. Maybe after I graduate and we move. So, I added some fresh basil from my happy basil plant in the corner, some salt and pepper (always essential) and tasted the sauce. Hmmm. Quite lacking, I thought, so I threw a bit of garlic, crushed chile pepper, thyme and lemon juice in. Much better. Finding reasonable salmon here made me long to be back in Seattle, where the salmon runs are heralded by banners and everyone knows the name of at least five different species (Coho, Steelhead, Sockeye, King, and Copper River are my five). I could have acquired a whole Coho on ice from Central Market, had it filleted by the nice fishmonger and had a beautiful side of salmon for dinner and leftovers for salmon stock later. Instead, I finally found two theoretically not-farmed salmon portions on styrofoam at Winco which looked acceptable. I had to skin it myself, though this time it went quite quickly and easily. Ah well, maybe next year I can snag a job in Seattle and move us back there. Ahem. Anyway, enough with the daydreaming and on to the challenge! I wrapped each portion of salmon individually, cutting the pastry sheet in half. They fit onto my small quarter-sheet pan, which was rather nice. At least there was enough sauce to go around, which I often find to be a problem with sauce recipes. Of course, I did wind up adding a lot more cheese to get to the consistency described than was called for, so that helped. Overall, this dish came out very well. The pastry-wrapped fish is not really to my taste, however, so I wouldn’t opt to make this again. I would much prefer a simple broiled salmon with butter and lemon to this. But, if it appeals to you, I can vouch that it is quite good. Preheat oven to 400F/200C. Whiz kefir cheese, ricotta, spices, garlic, basil and mixed greens along with a healthy pinch of salt and pepper into a creamy green sauce. Roll out puff pastry and place on a parchment- or foil-lined baking sheet. Brush some of the sauce over the area where the salmon will rest, then lay the salmon on top. If there’s a thin tail-end, tuck it under. Spoon a goodly portion of the sauce onto the salmon. Fold the pastry over into a neat parcel, trimming the edges neatly. Make three cuts to allow steam to escape. Beat the egg, adding a little water, to produce an egg glaze. Brush the pastry well with the glaze. Bake for 30 minutes or until it’s golden brown and delicious. To test whether the salmon is fully cooked (since the flake test cannot be used), carefully insert the tip of a paring knife through one of the vents into the salmon and wait 3 seconds. Press the flat of the blade against your wrist (carefully, please), if it’s hot, it’s cooked. Do you tweet? Follow me on Twitter! This entry was posted in american, daring cooks, fish, recipes, sauce, untranslated. Bookmark the permalink. this looks amazing, love your way with this challenge. Very nicely done! I love how you tweaked the sauce, sounds so tasty!! 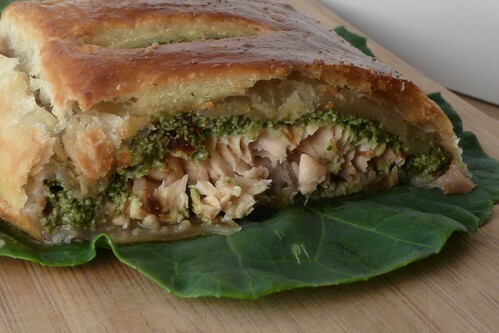 Your pastry looks so flaky and yummy I bet it was great with your salmon! Looks perfect! Congrats on a very successful challenge! Chef_D: Thanks! I was really happy with the sauce, I used the leftovers to dress up some pasta for lunch the next day — which worked quite well, I might add. Rochelle: I wish I could take credit but the Pepperidge Farms puff pastry was definitely a worthwhile buy. Despite the fact that you didn’t like it was much you still did a great job and the results look wonderful. Love your added cheese too and yes, the recipe definitely needs additional seasoning! Simone: Thanks! It was an interesting challenge – the cooking itself wasn’t particularly challenging, but coming up with the right blend of cheese and spices for the sauce, which I’ve never had, so it would work properly with the pastry and salmon, which I’ve never had together, was a lot of fun. Garlic is a must for the sauce! Great job. Syrupandhoney: Garlic is a must for everything! (Or almost anyway.) Thanks! What a beautiful job on the salmon en croute and mouth watering photos too! I agree about the garlic!